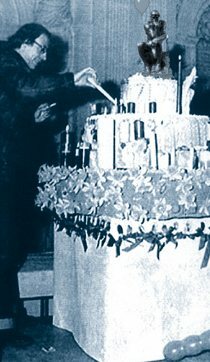 Art's Birthday is an annual event first proposed in 1963 by French Fluxus artist Robert Filliou. He declared that 1,000.000 years ago, there was no art. But one day, on the 17th of January to be precise, Art was born when someone dropped a dry sponge into a bucket of water.Modest beginnings, but look at us now. Since 1999, Kunstradio has participated online, onsite, and onair in the global celebrations of Art's Birthday inviting artists to stream sound and video in live exchange with other institutions or individual artists. Over the years, Kunstradio has collaborated with partners around the globe, such as Western Front, Vancouver; First Floor Eastside, Tilos Radio, Budapest; Stadtwerkstatt Linz, Radio Fro, Linz; Radio Kinesonus, Tokyo; Ping FM, Weimar; Citr FM, Vancouver and many more.